I'm fortunate to live in a part of the world with mild weather. Still, sometimes the power blinks, and I'd like to protect my computers and have them stay up if the power interruption is brief enough. For years, I used a CyberPower 1250 with a serial line connected to my OS/2 server. It was compatible with the UPS service built into Warp Server, and it did good service. However, lead acid batteries don't last forever, and last time the power failed, the CyberPower UPS did not last long enough for my computers to shut down cleanly. Replacing the lead-acid batteries is easy, but I realized that over time, my need for backup power was less than it had been. I could buy a new, smaller UPS for about the same cost as replacing the batteries in the old UPS. 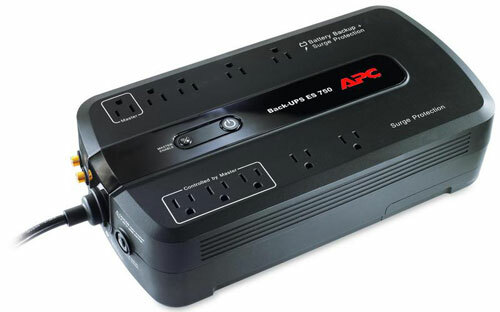 I chose the APC Back-UPS ES 750G, which has an Energy Star rating. The new UPS will save substantial electricity compared the old one, and with the cost per KWh in my part of the world, the new UPS will pay for itself in less than two years. New UPS are connected via USB rather than serial line, so first, I looked for new software to monitor and control the UPS. I found APC UPS monitor, a monitor for APC Uninterruptable Power Supplies (UPS) written by Larin Yury (aka Improver). The first thing to do is to connect the UPS and all the equipment. Once this is up and running, connect the USB cable to the computer. Use the USBDock in the eCS utilities folder to generate a report of the USB settings. On that report, identify the Vendor ID (0x051D), Product ID (0x0002) and Device Release (0x0101). The APC UPS monitor software uses the USBECD.SYS driver to communicate with the UPS. The driver may be downloaded from the Hobbes repository. Install this driver and add a line to config.sys. Note the Vendor ID, Product ID and Device Release in the device driver parameters must match the ones in the USBDock report. Once this line is present in config.sys, it is possible to install the APC UPS monitor using its WarpIN installer. The installer checks for the line in Config.sys, so be sure to add that first. After rebooting, the APC software should be functional. While a configuration program is offered, I didn't see any parameter I needed to change for basic operation. APC UPS Monitor provides an icon on the desktop that shows the UPS status. The icon updated when I decided to test the UPS and software by unplugging the UPS to simulate a power failure. Clicking on the APC UPS Monitor status icon opens a status window. After my power test, the battery status slowly moved from 90% back up to 100%.